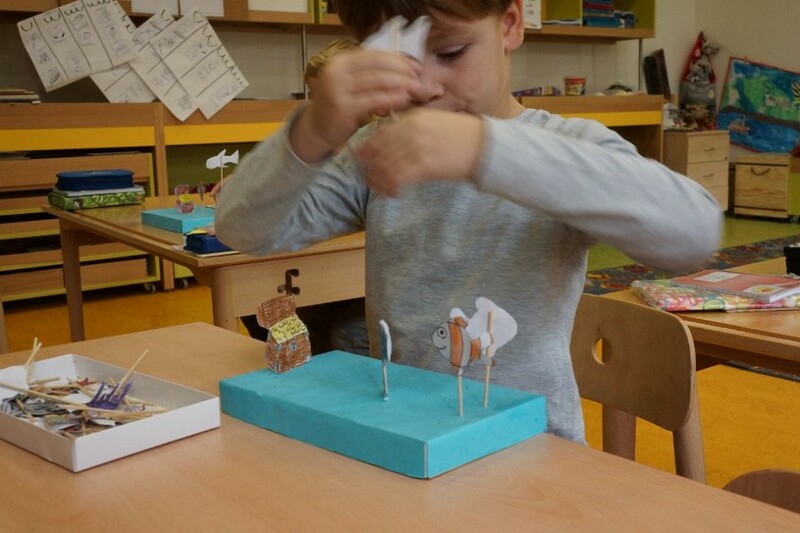 In this activity, pupils produced little paper theatres for teaching mathematics. They formulated word problems and came up with themes for individual theatres. They tested functionality of the theatres together with schoolmates from the preparatory class. A theatre is a teaching aid that helps children independently create and solve word problems in mathematics. Children first create a set of paper characters or objects. Then they manipulate them in space, with skewers and a surface with holes used for fixation. It is a traditional math aid in the community of Creative Schools (Tvořivé školy). The idea is that pupils themselves produce a simple educational aid, with which they work and then use to formulate word problems. In this activity, pupils from one class provided the game to another class. This activity was participated by 18 children of 3.B. The activity took place in the classes of Practical Training and Mathematics (8 lessons). In the preparatory lesson, the class agreed on the theme to be artistically processed. Pupils considered what options a given theme may bring and if they are capable of treating it artistically. They agreed on the theme of the sea. In the next two lessons, pupils devised and drew their own themes for individual components of the theatre – starfish, sea anemone, jellyfish, mussels, treasure chest. Eight best themes selected by the teacher were copied and presented on the next Practical Training class for colouring, cutting out, and gluing to skewers. In the last stage of production, the very theatre was created from a box of chocolates with a lid, covered with a blue “water” paper. The box lid had holes made in it. In Mathematics class, pupils in pairs prepared interesting word problems and they themselves tested the functionality of the theatre. After the testing, the theatre was introduced in the preparatory class. Pre-schoolers handled the theatre easily, recognized its individual parts without problems, and provided excellent cooperation to the authors in solving the word problems together. The biggest problem was to make up a performance. I learnt how to make up a story. I learnt how to cooperate with others. We learnt how to make up a game for others.